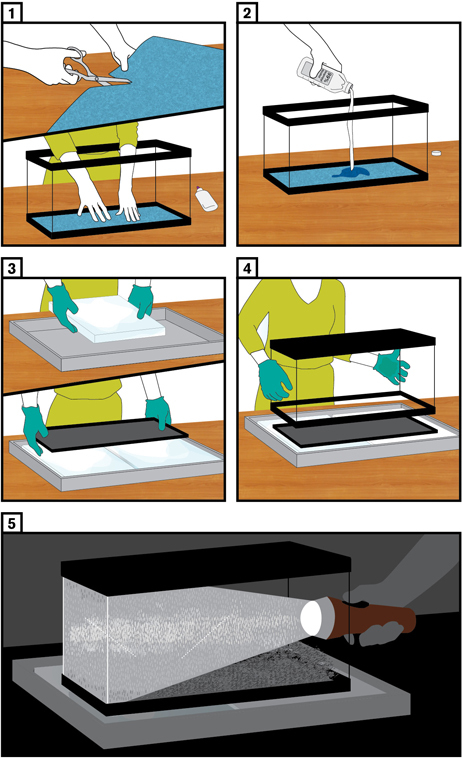 Make a cloud chamber and watch fundamental particles zip through your living room! The scale of the detectors at the Large Hadron Collider is almost incomprehensible: They weigh thousands of tons, contain millions of detecting elements and support a research program for an international community of thousands of scientists. But particle detectors aren’t always so complicated. In fact, some particle detectors are so simple that you can make (and operate) them in your own home. The Continuously Sensitive Diffusion Cloud Chamber is one such detector. Originally developed at UC Berkeley in 1938, this type of detector uses evaporated alcohol to make a ‘cloud’ that is extremely sensitive to passing particles. Cosmic rays are particles that are constantly crashing into the Earth from space. When they hit Earth’s atmosphere, they release a shower of less massive particles, many of which invisibly rain down to us. Cut the felt so that it is the size of the bottom of the fish tank. Glue it down inside the tank (on the bottom where the sand and fake treasure chests would normally go). Once the felt is secured, soak it in the isopropyl alcohol until it is saturated. Drain off any excess alcohol. Place the lid on top of dry ice so that it lies flat. You might want to have the dry ice in a container or box so that it is more stable. Flip the tank upside down, so that the felt-covered bottom of the tank is on top, and place the mouth of the tank on top of the lid. Wait about 10 minutes… then turn off the lights and shine a flashlight into your tank. * * * What is happening inside your cloud chamber? The alcohol absorbed by the felt is at room temperature and is slowly evaporating into the air. But as the evaporated alcohol sinks toward the dry ice, it cools down and wants to turn back into a liquid. The air near the bottom of the tank is now supersaturated, which means that it is just below its atmospheric dew point. And just as water molecules cling to blades of grass on cool autumn mornings, the atmospheric alcohol will form cloud-like droplets on anything it can cling to. When a particle zips through your cloud chamber, it bumps into atmospheric molecules and knocks off some of their electrons, turning the molecules into charged ions. The atmospheric alcohol is attracted to these ions and clings to them, forming tiny droplets. The resulting tracks left behind look like the contrails of airplane—long spindly lines marking the particle’s path through your cloud chamber. What you can tell from your tracks? Many different types of particles might pass through your cloud chamber. It might be hard to see, but you can actually differentiate between the types of particles based on the tracks they leave behind. Sorry—not a cosmic ray. When you see short, fat tracks, you’re seeing an atmospheric radon atom spitting out an alpha particle (a clump of two protons and two neutrons). Radon is a naturally occurring radioactive element, but it exists in such low concentrations in the air that it is less radioactive than peanut butter. Alpha particles spat out of radon atoms are bulky and low-energy, so they leave short, fat tracks. Congratulations! You’ve got muons! Muons are the heavier cousins of the electron and are produced when a cosmic ray bumps into an atmospheric molecule high up in the atmosphere. Because they are so massive, muons bludgeon their way through the air and leave clean, straight tracks. If your track looks like the path of a lost tourist in a foreign city, you’re looking at an electron or positron (the electron’s anti-matter twin). Electrons and positrons are created when a cosmic ray crashes into atmospheric molecules. Electrons and positrons are light particles and bounce around when they hit air molecules, leaving zig-zags and curly-cues. If your track splits, congratulations! You just saw a particle decay. Many particles are unstable and will decay into more stable particles. If your track suddenly forks, you are seeing physics in action!